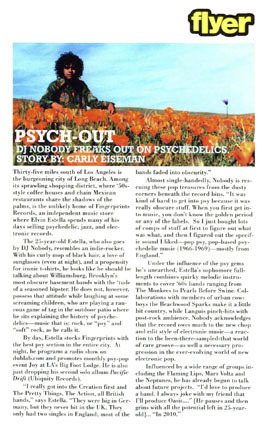 DJ NOBODY FREAKS OUT ON PSYCHEDELICS. Thirty-five miles south of Los Angeles is the burgeoning city of Long Beach. Among its sprawling shopping district, where '50s-style coffee houses and chain Mexican restaurants share the shadows of the palms, is the unlikely home of Fingerprints Records, an independent music store where Elvin Estela spends many of his days selling psychedelic, jazz, and electronic records. The 25-year-old Estela, who also goes by DJ Nobody, resembles an indie-rocker. With his curly mop of black hair, a love of sunglasses (even at night), and a propensity for ironic t-shirts, he looks like he should be talking about Williamsburg, Brooklyn's most obscure basement bands with the 'tude of a seasoned hipster. He does not, however, possess that attitude while laughing at some screaming children, who are playing a raucous game of tag in the outdoor patio where he sits explaining the history of psychedelics  music that is: rock, or "psy" and "soft" rock, as he calls it. By day, Estela stocks Fingerprints with the best psy section in the entire city. At night, he programs a radio show on dublab.com and promotes monthly psy-pop event Joy at LA's Big Foot Lodge. He is also just dropping his second solo album Pacific Drift (Ubiquity Records). "I really got into the Creation first and The Pretty Things, The Action, all British bands," says Estela. "They were big in Germany, but they never hit in the UK. They only had two singles in England; most of the bands faded into obscurity." Almost single-handedly, Nobody is rescuing these pop treasures from the dusty corners beneath the record bins. "It was kind of hard to get into psy because it was really obscure stuff. When you first get into music, you don't know the golden period or any of the labels. So I just bought lots of comps of stuff at first to figure out what was what, and then I figured out specific sound I liked  pop psy, pop-based psychedelic music (1966-1969)  mostly from England." Under the influence of the psy gems he's unearthed, Estela's sophomore full-length combines quirky melodic instruments to cover '60s bands ranging from The Monkees to Pearls Before Swine. Collaborations with members of urban cowboys the Beachwood Sparks make it a little bit country, while Languis pinch-hits with post-rock ambience. Nobody acknowledges that the record owes much to the new chop and edit style of electronic music  a reaction to the been-there-sampled-that world of rare groove  as well as a necessary progression in the ever-evolving world of new electronic pop. Influenced by a wide range of groups including the Flaming Lips, Mars Volta, and the Neptunes, he has already begun to talk about future projects. "I'd love to produce a band. I always joke with my friend that I'll produce Oasis…" [He pauses and then grins with all the potential left in 25-year-old]… "In 2010."